The first run the car had in 11 years was August 2002 on a trip to the Lake District covering 480 miles. Verdict - drives like a dream have not enjoyed driving a car so much since I last drove a Mini in the early 70s. Here my interest in British Leyland cars ended until in 1996 I found the original sales display used by WH Alexander Ltd in their premises in Victoria Street Belfast. I had made numerous attempts to purchase several Marinas on EBay but without success. In July 2005 I was introduces to DIJ 2802 a local car in original condition with 64000 miles on the clock. The car has never been welded or painted and the interior is excellent. On my first outing to a local event at Mount Stewart in County Down I bumped into the salesman who sold the car to its original owner. Earlier this year I decided that the crazed and watermarked paintwork required attention so a re spray was arranged which restored the appearance of the car to its original bright appearance. I have taken the car on several car runs and heads have turned as it travelled through the roads of County Antrim. Performance is as I remember it in the days of the 1970’s ,good running with a little bit of over and under steer. The use of radial tyres has helped to reduce this problem. 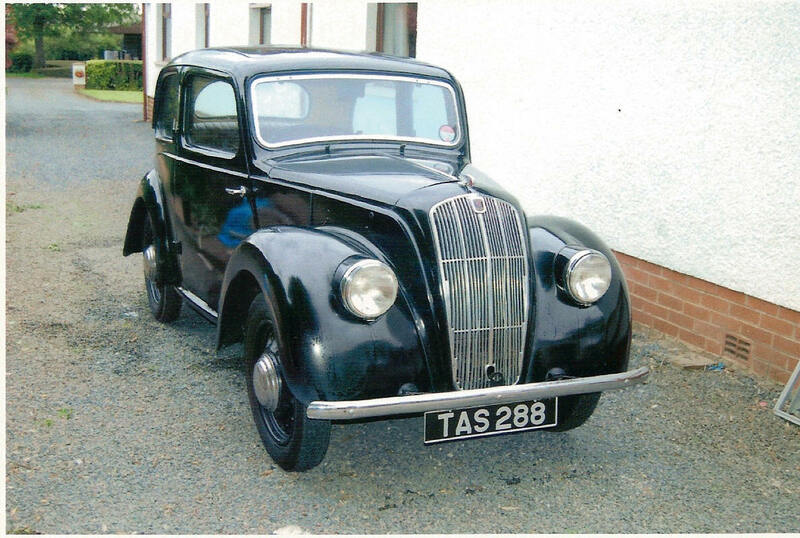 My first knowledge of this car was when I was approached by a member of the club to place an advert in the club magazine offering the car for sale. 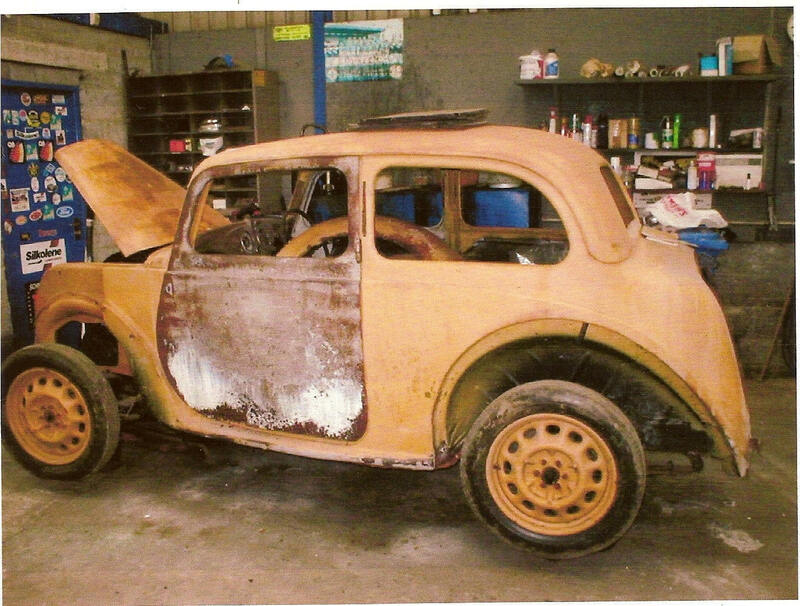 Having just completed the restoration of my partner, in crime (Restoration of Old Cars), John’s Morris 10/4 after some six and a half years I thought that this would be the opportunity to start a new project. We went to inspect the car at Ravarnett as seen in the first photograph and decided it was worth a try, nothing ventured nothing gained. An assessment of what was required to be done and what parts were needed to complete the project was completed. The following November John and myself set off on our now annual trip to the Classic Car Show in Birmingham armed with a list of 32 items of parts etc required as an initial guide to get the project underway. I was fortunate to meet, on the Morris Register Stand, Martin Wills who was able to provide seventy five percent of my list. The following March I went over to Melton Mowbray in Leicestershire accompanied by Barbara to collect the parts. It was a good job we were travelling light and did not take a case with us as it would not have fitted in the car. Barbara was just lucky enough to have space for the return journey. Now that many of the parts required for the restoration were assembled it was full steam ahead with the work. Many phone calls to Martin produced many pieces of advice and parts required. Without his help restoration would have been very difficult. Over the next three years, mainly on a Wednesday evening work continued sometimes one step forward and two or three backwards until after many frustrating moments the end result as shown in the second photograph was achieved. Having little or no experience in restoration work I feel that the end result although not perfect, is something to be satisfied with.